as I promised I will write about tracking actual work and cost on the Project in MS PROJECT 2010. As you can see, in this Table I have work in hours which is based on formula Duration in days X Hours per day. For the Task4, Duration is 7 days, e.g. 7 days X 8 hours per day = 56 hours! Notice that Actual duration is 2,8 days, and Remaining duration is 4,2 days! Why? Because Actual work is 22.4 hours, Actual Duration is 22,4 hours / 8 hours per day = 2,8 days. And Remaining duration is Duration – Actual duration = 7 days – 2,8 days = 4,2 days. I will not explain how MS PROJECT 2010 calculates fields because it does it on the same way as it was described in my previous Post. Which method to use? The answer is simple: The most accurate! And of course, consider the time you need to fulfill all those fields! OK! How to track Costs, or better how to put the real costs in your Project? As you can see, Remaining cost is same, and Total Cost is$33.180 (e.g. Actual cost + Remaining). WATCH OUT! DO NOT USE THIS METHOD IF YOU ARE NOT 10000000% SURE WHAT YOU ARE DOING, BECAUSE YOU CAN RUIN YOUR PROJECT. You can also change the Baseline field! DO NOT DO IT! LEAVE IS AS IT IS! 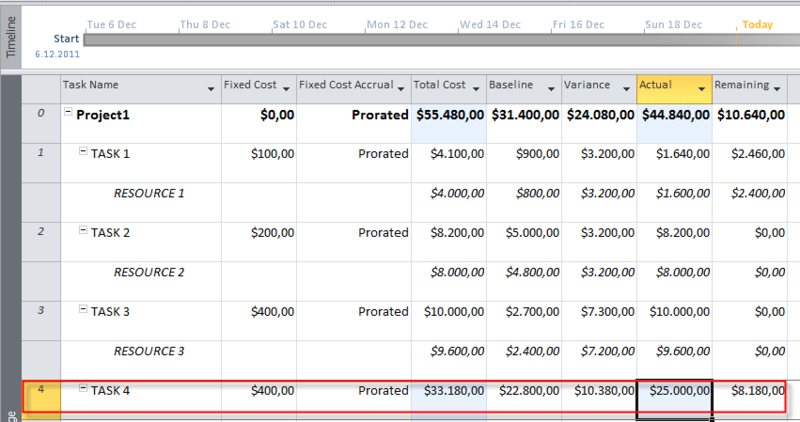 In my next post I will show you, how to track Variances against planned values using different tables. This entry was posted in MICROSOFT PROJECT, Microsoft PRoject 2010, MS PROJECT 2010, PMI, PRoject Management and tagged Microsoft Project 2010, Microsoft Project 2010 - tracking, MS PROJECT, MS PROJECT 2010, Project Management. Bookmark the permalink. 1). When you manually updated the actual work in each of the 3 days for Resource 4 in Task 4 to 4, 12 and 20 hrs Project calculated actual duration as 3 days. As the default is that one working day is 8h, how did Project calculate the Actual Duration to be 3 days instead of 4+12+20 =36h/8h = 4,5d ? 2). How in this case does Project uses the scheduling formula Work = Duration * Units to calculate the total task Duration of 5.5 days ? can you send me the mpp file to nenad@ntrajkovski.com? b. In the Actual Start and Actual Finish Column enter the actual start and finish dates. 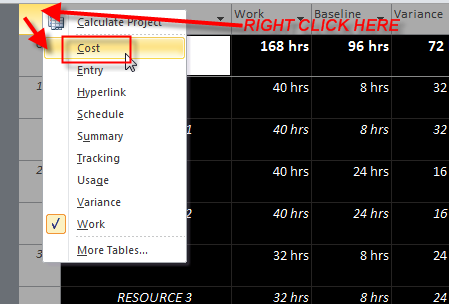 You will notice that the work % Complete is shown as 100% and the number of hours shown in the Actual work column against the resource(s) will now go up. The Actual Cost will also show a higher figure and the Cost Variance column will reflect the additional cost incurred since MS Project assumes that the resource has put in extra work during the extended period. [Please note that the resource will be shown as having worked only from the Baseline Start date until the Actual Finish date. Hence, the extra charges will apply only for the period worked between the Baseline Start date and the Actual Finish date]. c.	However, if the delay in completing the task was because of factors like rain or delay in sourcing material, etc., and the resource actually worked for just the number of hours that was planned, then, do the following: Double-Click on the Resource Name (remember you must be in the Task Usage View) and in the Assignment Information dialog box that opens up (see illustration below), select the Tracking Tab and enter the value of the Baseline work in the Work and the Actual Work field. You will notice that the Actual Duration has gone up, but the Actual Work and Actual Costs have remained the same as the Baseline. d.	In case you believe that some of the resources in the above scenario have actually worked longer than the Baseline figure, then, only for such resources, enter the number of hours you believe they have worked in the Work and the Actual Work field in the said Assignment Information dialog box. 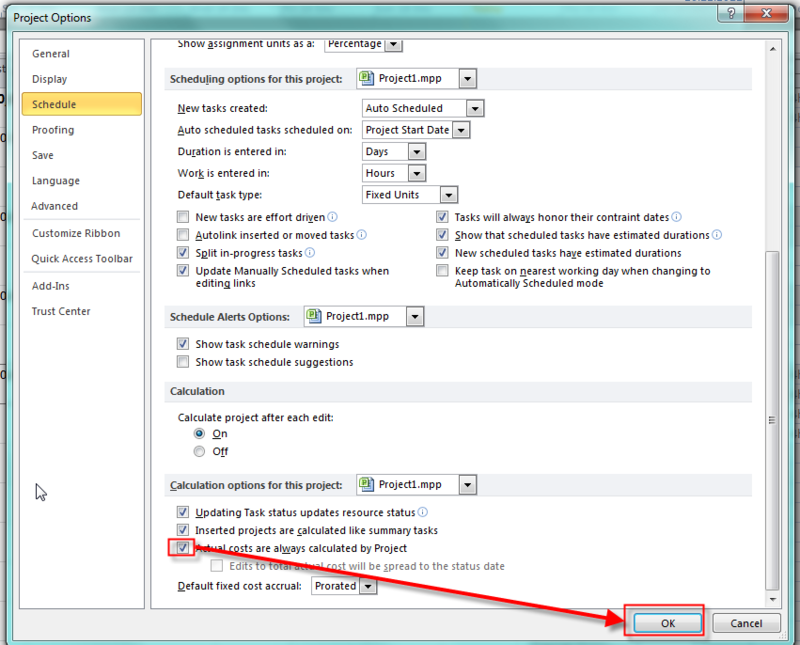 e.	If, for instance, you are sure that all the resources assigned to the delayed task have actually worked only for the scheduled period, then the simplest thing to do, is to first change the Task Type to Fixed Work task, and just enter the Actual Start and Actual Finish dates in the appropriate cells. This way, the duration will change without changing the costs. However, depending on which resource has been assigned, and if the resource is already assigned elsewhere during the same period, MS Project may show the task as 100% complete but the Work and the Actual Work may show 0 hrs. (This will mean that the Cost Variance column will show positive Cost variance since the resource is shown as not having worked at all. In this case, remember to enter the Baseline Work value in the Actual Work cell. Now, the Work column will also show the same value and the Cost Variance will be zero. f.	In case you believe a resource has worked for a lesser number of hours than was planned, then, after entering % Work Complete as 100%, change the Work and Actual Work to a lesser number. In this case, there will be a positive Cost variance. g.	Similarly, if you believe a resource has worked for a larger number of hours than was planned, then, after entering % Work Complete as 100%, change the Actual Work to the higher number for the resource concerned. In this case, there will be a Cost variance, because the Resource has worked for more number of hours than was scheduled. h.	In case the task is not completed, and you wish to update the status of the task on a given day, you can enter the actual work completed by the resource in the Actual Work field in the Assignment Information box. i. In case the resource completes his assignment you must enter the total hours he actually worked in the Actual Work column. 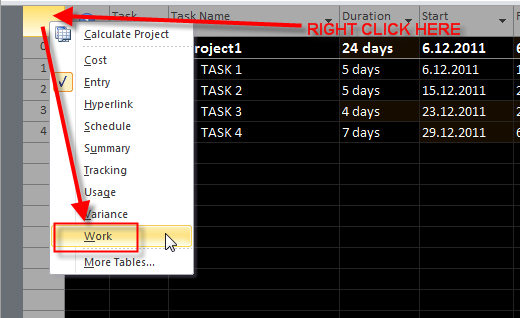 If all resources assigned to a task complete their assignments, you may enter the %Work Completed as 100% and, in case the actual work was lesser or more than the baseline, you may increase (or decrease) the actual work the resource put in, by entering the values in the Actual Work column. In case the actual work values change, MS project may increase or decrease the Actual Finish Date. j. 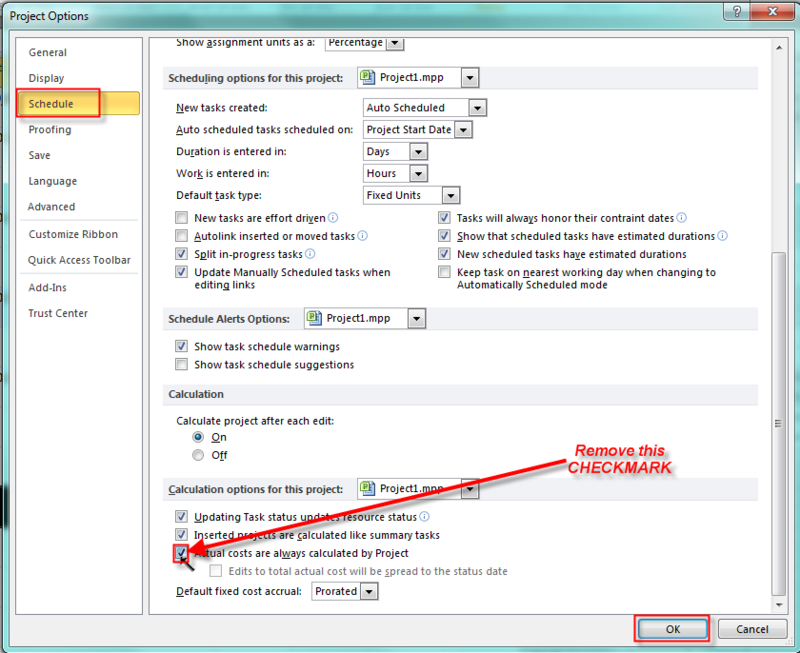 In case you wish to ensure that the Actual Finish date does not change, despite the resources having worked less or more than the baseline, then you should go to the Timephased portion of the Task Usage View and enter the actual work under the respective dates. k.	In some cases, in a Fixed Work task, you will notice that when you enter the Actual Finish date, which is more than the Baseline Date, the Work shown against resources becomes Zero (I hope someone can tell me why this happens). 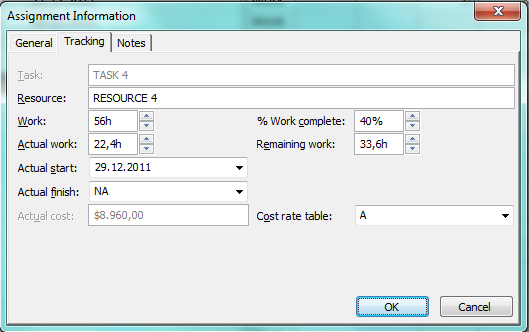 In such a case, copy the Baseline Work values and paste it in the Actual Work column against the Resource. However, if by doing this the Actual Finish date changes, then you will need to enter the Actual Finish date once again. This will not alter the Work Values, and will reflect the desired actual finish date. In some instances, entering the Actual Finish Date after entering the Actual Work may shift the Actual Finish further than the desired date. This happens because MS Project enters the Actual Work in a time-period after the Actual Finish (youi can see this in the Time-phased section of the Task Usage view). In such case, go to the time-phased section and enter the Actual Work in the period when the task was active. By doing this, the values entered in the period when the resource did not work, will be automatically removed. If someone has a simpler and more efficient solution, please share it. unfortunately I can not enter the exact number of hours spent on a Taks by a particular Resource in the Task Usage as described (in your example you enter manually 4, 12 and 20 hours in days, so the Actual work is 4+12+20 hours = 36) . The fields are grayed out. How can I activate them? thanks for your fast response. During preparation of the example I found the problem. The resource assignment was not correct. It works now as expected. Thank you so much Nenad for this nice document. However in my case, I am not much concerned about Task duration or Start/Finish date. My planned start/finish can be different from actual start/finish. What I am looking for once I put Actual Start/Finish date for a task (out of many task) in a project, then it will calculate and give me how much % of project have done. What I mean, the % is not based on duration but on task. Also there may be weight associated with the task. Is this possible in MS Project? Can you give me some light on this? Thanks again for your nice document and reply. I am having problem using and getting a desired output in MS project. – Also I want to provide date of these tasks actually started or finished. How should I proceed? I think my requirement is pretty simple but I am not able to get the desired output. Appreciate if you can help. I will write Blog Post about it in next 12 days. OK? For Actual work you should look at Work or Tracking Table! Let me know if you want further explanation! Hi Nenad, I’ve had two courses in MS Project and read two extra books (besides the class text). No One ever mentioned the Right Click!! Your explanations are great, easy and to the point. Great job!! —-why is project overriding my entered % complete? I have tryed to do the same thing, and everything works fine! I put Task with 16 days duration. Start date was 01/13, end det was 02/03 (beacuse 02/05 is Sunday, and status date 1/27. Project start date was 1/13. fixed duration. 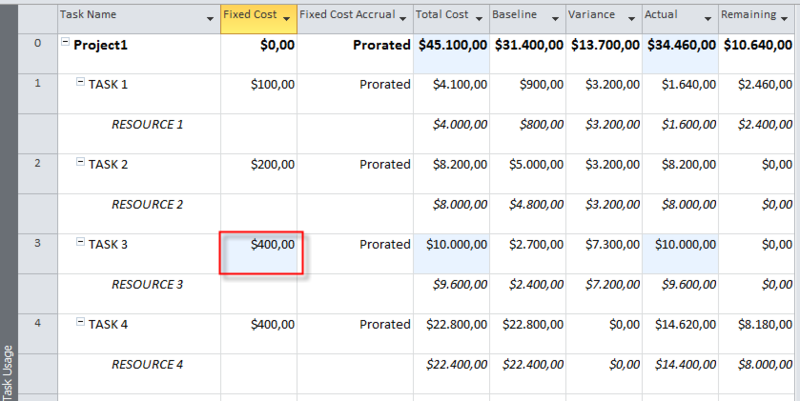 Have you done the “how to track Variances against planned values using different tables” post yet? I am trying to figure out how to update resource actuals, find variances from projected, and if it is worth the time and trouble in doing so to add this metric to the master schedule or not or if it will make it too complicated. Yes, I did! Here is the Link: https://ntrajkovski.wordpress.com/2011/12/29/tracking-the-project-progress-with-using-different-tables/. If you need some further information, don’t hesitate, just give me an email!